Obama claims that the option is not off-the-table. He would like to blame George W. Bush for everything going on today in this once-robust, developing country. But he cannot: He perpetuated the war as surely as Bush began it, predicated on false claims and in the interest of Big Oil...read below. He had the opportunity to do as he had promised: Sadly, he did not, instead falling victim to the temptation of greed - played like a cheap harmonica by Big Oil. That is the reason for the sudden, immediate, and aggressive rhetoric. As Angela Merkel would say, the “Shitstorm” facing Iraq today began nearly eleven years ago. The result for us? 5,000 dead Americans. A country financially broken, just as the Soviet Union had been by Afghanistan. Thrust into economic crisis. The average price of a gallon of gasoline for the last two years of the Bush presidency? $4.10. Monthly gasoline bill for commute? Surging from $280 to more than $900 for the average American worker. It’s just available data: data doesn’t lie; those who supported (and support) our involvement (and re-involvement) in Iraq, did (and do). The consequences: the average American was thrust into financial apoplexy. The great house of cars tumbled, and we have been mired ever since in the pungent bile of our Hitleresque pursuit of “radicals” at the cost of freedom, the environment, and stability - both here and in the rest of the world. Re-involved in Iraq? I pray not: We can’t weather that storm again. It will be our demise. Watch, The Abduction and Trial of George Bush, at no charge, here. Above the Red Line is the current state of insurgency. Below, to the right, is the reason for Obama’s concern. If you share in this view, use this link to voice your opposition: http://diy.rootsaction.org/petitions/do-not-bomb-arm-or-send-troops-to-iraq. There you’ll be able to voice your opinion in a (somewhat) meaningful way...at WorldBeyondWar.org. Are we pacifists here at The Independent Daily? No. In fact, we’re armed much of the time. Are we Revolutionaries? No, not in your sense of the word. We simply believe that the aggression that we have brought to others has done enough damage to us and to those we have visited. We cannot rebuild what remains of America while fighting battles on behalf of Big Oil...they ought to be able to finance their own campaigns of death and destruction. 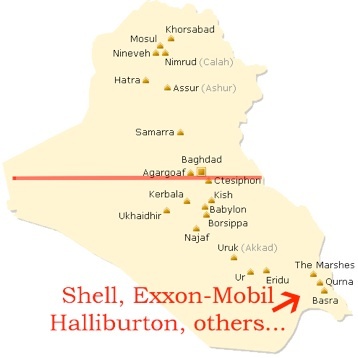 5,000 American dead and hundreds of thousands of Iraqis, but, of course, “it was a war on Terror...” Shortly after, Shell and Exxon-Mobil took control of the Majnoon and West Qurna oil fields in Iraq, thanks to George W. Bush’s contrived war. About 40% of Americans (coincidental to the population of those ranging from slightly to severely retarded in America) still contend that our incursion into Iraq was purely out of revenge for 9/11, when Iraq had nothing to do with 9/11. If it was not a war for Oil, why, now, that Iraq’s insurgents are advancing on Baghdad and wresting control of the country from the puppet government we installed, are “Oil Prices” spiking? Do you not see the obvious? Do you not understand that the depth of Bush and Cheney’s depravity has manifest a Middle East wrought with discontent and served as the catalyst for what is occurring today in the Middle East, Africa, regions of Asia and elsewhere? Watch, The Abduction and Trial of George Bush, at no charge, here. The first step to bringing about a future for our children is to bring those who violate our laws and the basic premises of our existence to justice. George W. Bush must be brought to answer for his actions without the contrived veil of National Security. A true patriot would demand this of their government.